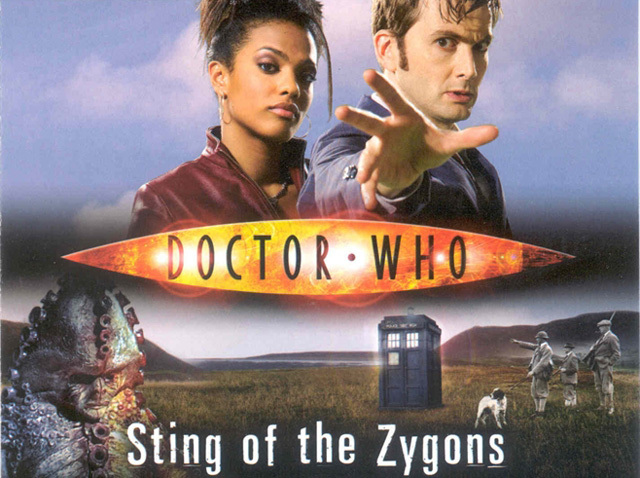 Doctor Who: STING OF THE ZYGONS | Warped Factor - Words in the Key of Geek. With sinister orange paving slab lookalikes the Zygons set to return tonight in Series Nine of Doctor Who, what better juncture at which to ponder a pre-Day Of The Doctor encounter with them for his Tenth incarnation? 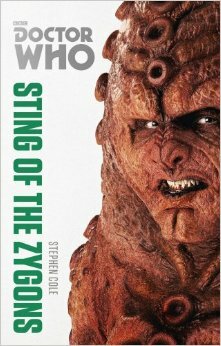 Stephen Cole's Sting Of The Zygons fleshes out a feature of theirs which we've yet to see - although it's hinted at in Terrance Dicks' Doctor Who & The Loch Ness Monster, his Target novelisation of Terror Of The Zygons. The title of the book rather gives away what that feature might be - their a deadly sting! The Doctor's new companion Martha Jones finds herself whisked off to the Lake District. This normally tranquil corner of Britain has been disturbed by the crash-landing of a group of the shape-shifters, who arrive in 1909. And they've brought along a couple of pets, one of which becomes the fabled "Beast of Westmorland". King Edward VII is even prepared to offer a knighthood to whomever of the many hunters swarming to the Lakes bags the creature. But the man who met them once before back when a pinstripe suit was a mere pipe dream knows the Skarasen is so much more than the implied basis for the Loch Ness Monster. DOCTOR: You've been hiding too long, Broton. It's become a habit. BROTON: What do you mean? DOCTOR: I thought the plan was to conquer the world. BROTON: The plan has not changed. DOCTOR: But you can't rule a world in hiding. You've got to come out onto the balcony sometimes and wave a tentacle, if you'll pardon the expression. BROTON: In a few hours there will be no further need of secrecy. Have no doubt, Doctor. And arguably they've picked the perfect spot from which to launch an invasion here, no doubt using similar logic which had seen them choose the Scottish Highlands for their earliest attempt to take our planet. Idyllic, too..
"Westmorland presents continuous succession of mountain, moor, and fell, intersected by deep winding vales, traversed by numerous streams. The arable land is mostly confined to the valleys, where the soil usually consists of a dry gravelly loam, well adapted for turnips, but the greater part of the county is natural pasture. A few tracts of woodland remain of the forests which formerly clothed all the hills. The mineral productions include graphite, marble, roofing slate, and some coal, lead, and copper. The only manufactures of any consequence are the coarse woollens of Kendal." So said Barclay's Complete & Universal English Dictionary (1842). Sadly nobody stops to talk over the problem of hunting a giant cybernetically augmented sea monster over some lovely Kendal mint cake. If you happen to be resident in Cumbria, though, you may well have noticed a certain agenda towards the place in Series 7! While pondering the mystery of the impossible girl, the Eleventh Doctor finds himself staying at a monastery there as far back as 1207, for starters. ABBOTT: Ahem. I'm sorry to intrude, but the bells of Saint John are ringing. DOCTOR: I'm going to need a horse. ABBOTT: The woman twice dead, and her final message. He was drawn to this place of peace and solitude that he might divine her meaning. If he truly is mad, then this is his madness. The Rings Of Akhaten then contained a reference to the Lake District itself. DOCTOR: Leg it where, exactly? DOCTOR: Oh, the Lake District's lovely. Let's definitely go there. We can eat scones. They do great scones in 1927. CLARA: You're going to fight it, aren't you. DOCTOR: Regrettably, yes. I think I may be about to do that. CLARA: Say we actually find her. What do we say? DOCTOR: We ask her how she came to be whatever she is. DOCTOR: Because I don't know, and ignorance is, what's the opposite of bliss? DOCTOR: Yes. Yes, Carlisle. Ignorance is Carlisle. Apologies if you happen to live there! Let's finish with a lovely big bite out of some of the aforementioned mint cake. EMMA: So, what do we do? DOCTOR: Not we, you. You save Hila Tacorian because you are Emma Grayling. You are the lantern. The rest of us are just along for the ride, I'm afraid. We need some sturdy rope and a blue crystal from Metebelis Three. Plus some Kendal Mint Cake. Now, some tea with your slice of Kendal's finest as we return to proceedings at hand? After all, there's the small matter of the future of the entire world at stake! It's all rather a case of 'spot the Zygon', whether they be in human or bovine form, and the story ends a bit somberly, but it serves as a good reminder just why these orange rubbery things are so fondly remembered, despite, at the time of publication, having only appeared in one single Doctor Who televised adventure some 31 years previous.